Brown Rice Could Curb Cravings for High Fat Foods by Epigenetically Affecting the Brain | What is Epigenetics? High fat foods tend to be the most palatable and preferred choice of food in both humans and animals…and the most overeaten. We are more likely to eat an entire bag of chips or a pint of ice cream and still want more than overindulge on broccoli. Even though we need fat in our diets, most people eat far too much of it. The reason why is because fat makes food taste delicious. It enhances the flavor, aroma, and texture of food, making us want it even more. Many experts believe that foods high in fat, like junk food, may be addictive and can lead to compulsive eating. This may be why eating healthy, only the calories and nutrients our bodies need, is a challenge for so many people struggling with obesity. Scientists in Japan, however, may have good news with their latest study recently published in Diabetologia. They have found that a component in brown rice may epigenetically help reduce cravings for high fat foods. Based off their previous work, which investigated brown rice component γ-oryzanol’s effect on hypothalamic control, this study examined the same component’s impact on the functioning of the brain reward system in mice. Numerous studies have indicated that overeating and drug addiction share common mechanisms in terms of responses in brain reward circuitries. In particular, a high fat diet decreases dopamine D2 receptor (D2R) signaling in the striatum, a critical component of the brain’s motor and reward systems. But, targeting this area of the brain with obesity drugs has not been entirely successful and often comes with adverse side effects. Therefore, a natural food-based approach toward the brain reward system might be more effective in treating obesity and obesity-related conditions safely. This is where epigenetics comes in. 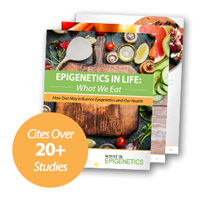 Epigenetic modifications can arise as a result of changes in the environment, including lifestyle and diet. DNA methylation, which is a primary regulator of gene expression, can be modified by nutrition. For instance, well-known research on agouti mice fed methyl supplements showed altered DNA methylation which correlated with their phenotype differences in weight and color. Plus, other animal studies have linked a maternal high fat diet with changes in DNA methylation within the brain reward system of their offspring, contributing to their strong preference for high fat foods. It is also known that DNA methyltransferases (DNMTs) are involved in regulating feeding behavior and that some natural food-derived substances, such as caffeic acid and epigallocatechin gallate (EGCG), have proven to act as DNMT inhibitors. To evaluate γ-oryzanol’s potential influence on the brain reward system and feeding behavior, the researchers studied groups of mice fed either a regular chow diet or high fat diet (HFD) for several weeks, giving them free access to food and water. Some HFD-fed mice were administered γ-oryzanol either in pellet form or by oral gavage. In addition, they also evaluated a strong pharmaceutical DNMT inhibitor (5-aza-2′-deoxycytidine). After 12 weeks, striatal levels of molecules involved in D2R signaling (D2Rs) in the brain were evaluated. The principal results showed that mice fed only a HFD had decreased production of D2Rs via an increase in DNA methylation of the promoter region of the D2R. On the other hand, mice fed a HFD and given γ-oryzanol had reduced expression and activity of DNMTs, which thereby raised and restored the D2Rs levels in their striatum. Correspondingly, body weight and high fat food preference measured throughout the experiment were lower in the mice given γ-oryzanol, especially in the group administered the brown rice component orally. As expected, the mice treated with the DNMT inhibitor, 5-aza-2′-deoxycytidine, had increased levels of striatal D2R which also reduced their preference for dietary fat. These findings were further supported by enzymatic in vitro assays confirming that γ-oryzanol as a complete structure inhibited the activity of DNMTs significantly. In the study, EpiGentek’s EpiQuik DNA Methyltransferase Activity/Inhibition Assay Kit provided quick measurement of total DNMT activity using a 96-stripwell microplate. The researchers used this kit to colorimetrically quantify the ratio or amount of methylated DNA, which is proportional to enzyme activity, through an ELISA-like reaction. Further investigation led them to suppose that γ-oryzanol might decrease the mRNA level and enzyme activity of DNMT1 in the striatum by negatively regulating the expression of ERRγ – a nuclear protein known to positively regulate the mRNA level of DNMT1. They found that γ-oryzanol essentially decreased ERRγ activity by roughly 40%. This was contrary to its effect on increasing protein levels of DNMT1 in the hypothalamus, where production of STAT3α (a positive regulator of DNMT1) is dominant. They also noted that ERRγ was highly expressed in the striatum of mice but not in the hypothalamus; vice versa was true for STAT3α. In the fight against obesity, epigenetics research is clearly needed. Studies like this on diet and the effects that individual nutrients or bioactive food components have on gene expression might ultimately lead to reliable anti-obesity treatments — ones that could help undo the damage of this particularly common and challenging health condition.